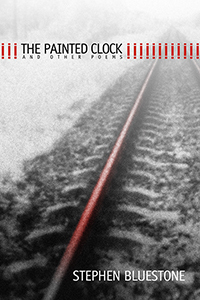 Many voices, including perhaps that of God, can be heard in the title poem of Stephen Bluestone's THE PAINTED CLOCK, a dramatic meditation on the journey to Treblinka, the death camp itself, and the ultimate destination within the camp, the death chamber. Within the camp, history comes to an end and Nature as we know it is abolished. Using Treblinka as a setting, Bluestone examines man's relationship with God. Having granted man the power of moral choice, can God, too, become a victim of the Holocaust? The title poem of this volume is a powerful exploration of the covenant, if any, between the Creator and the created. As Michael Waters has written: "'To pray is to go in all directions at once,' Stephen Bluestone acknowledges, and in poems that are prayerful and therefore formidably allusive, historical, and ambitious in their formalities, the poet relates 'stupendous tales…begging to be told.'" There are poems in this volume in which Lorca, Tolstoy, Kerouac, and Rilke's angelic orders hover over its pages. The title poem of THE PAINTED CLOCK stands in the tradition of Elie Wiesel and the Book of Psalms while recalling Paul Celan in its attempt to comprehend the Holocaust: 'Ashes, ashes, ashes, ashes, ashes, / the more we seek to know, the less we learn." In a reflection on the muses Bluestone adds that "I still can't say exactly what they do." But in poem after poem, Bluestone manages to keep their company and learn what they have to teach. Offering consolation through a modest but persistent faith, the author of THE PAINTED CLOCK struggles to name the light and darkness suffusing the world.